Is an Anchor Snubber Line really Necessary? Is an Anchor Snubber Worth the Bother? and if so, should it be on a bridle? An anchor snubber is essential if you've got an all-chain rode. Without one, in lively conditions, the shock loads transferred to the anchor are likely to dislodge it. It won't reduce the ultimate load on the anchor, but it will greatly reduce the severity of the snatching - and if you don't have a chain-stopper to take the load off the windlass, then the snubber line will. 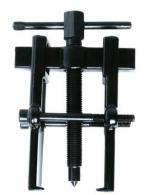 The snubber needs to have plenty of stretch if it's to act effectively as a shock absorber. 3-strand nylon is commonly used, but 8 strand multi-plait is even better. The longer the snubber the more it will stretch, so the frequently-seen short versions that barely reach the surface are of little or no use, other than to stop the anchor chain grating in the bow fitting. It's also a mistake to use a snubber that's too heavy as, for the the same load, a lighter rope will stretch more than a heavier one. It's worth remembering that nylon isn't entirely elastic. After a while it will lose its 'stretchability' and need replacing. Of course, if you have a rope-to-chain rode you won't need a snubber - you've already got one in the rope part of the rode. What Length of Anchor Snubber is Needed? 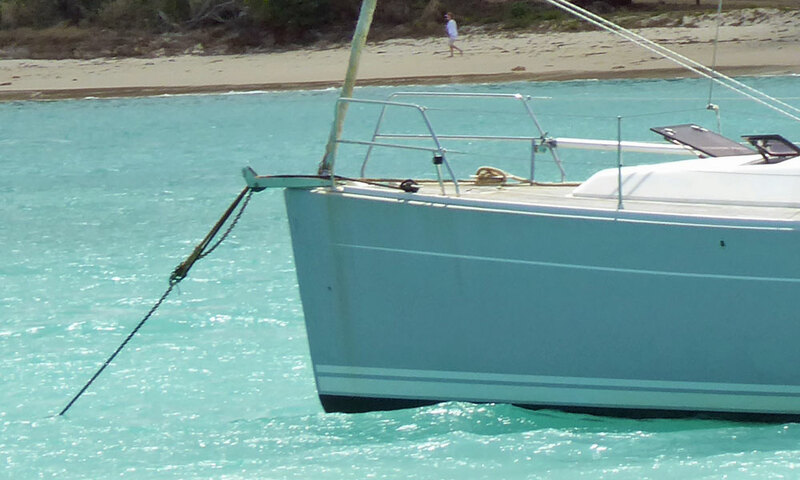 In a real blow, particularly when anchored in shallow water, a snubber length of around 15m or so isn't excessive. You won't need to deploy all of it in more moderate conditions - 6m would suffice then - but it's good to have the full length available should you need it. Remember that it's the stretch occurs over the full length of the snubber, not just the length between the bow and its attachment point on the chain, so there's no reason why you shouldn't attach it to a midships cleat rather than a bow cleat. 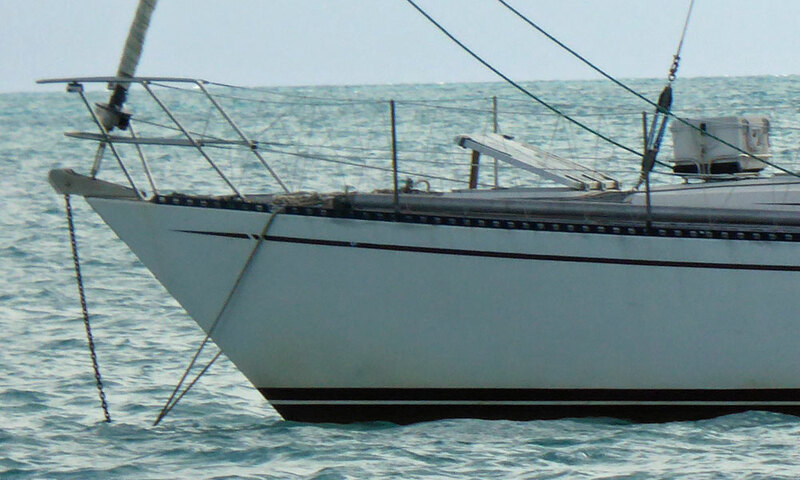 The ideal length depends on the characteristics of the boat and can only be determined by experience. 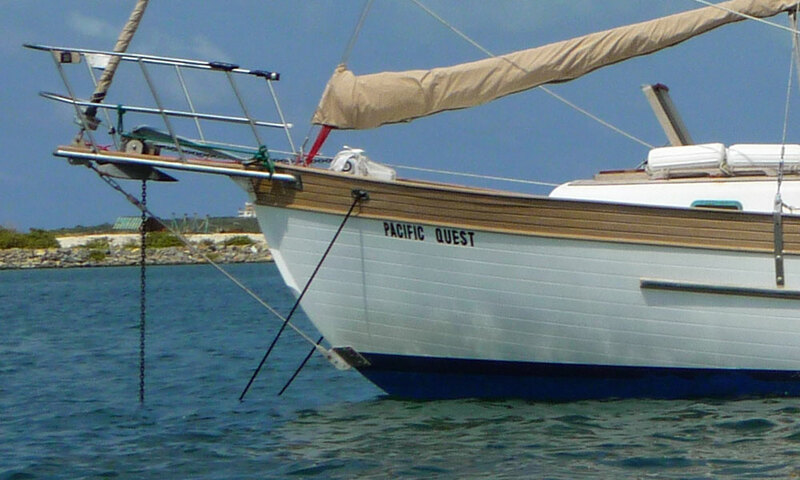 For example, you don't want the boat to spring forward in the lulls between gusts such that she lays broadside to wind and starts to swing around the anchor. You may need to adjust it to find the optimum length of snubber for a certain condition. 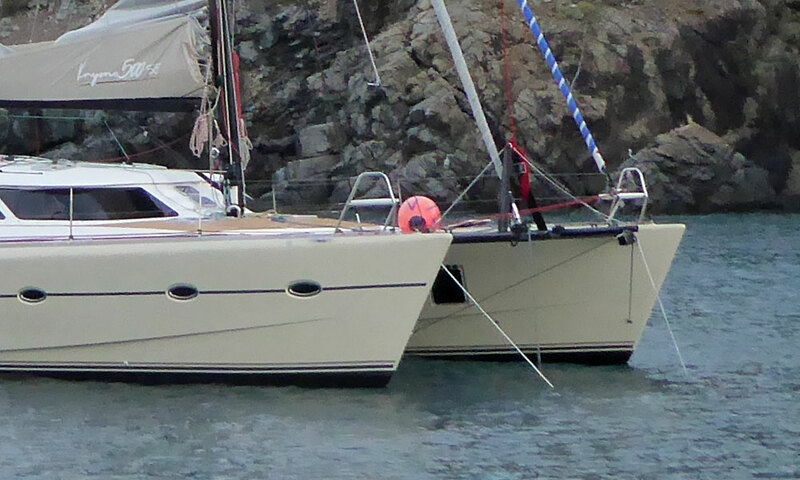 The long anchor snubber on this monohull should provide enough stretch, but it could benefit from some chafe protection from the reserve anchor in the stemhead fitting. This one's never going to work. Not only is it far too short, but there's not enough slack in the chain to allow the snubber to stretch. Top marks for this anchor snubber, which incorporates both a rubber snubber and chafe protection where it passes through the bow roller, and looks to be of a good length. The simple answer to that question is 'as small a diameter as you think you can get away with' as, pound for pound, a thin line will stretch more than a thicker one - but of course you don't want it to break. Which should be enough data for most of us! A Single Snubber Line or a Bridle? 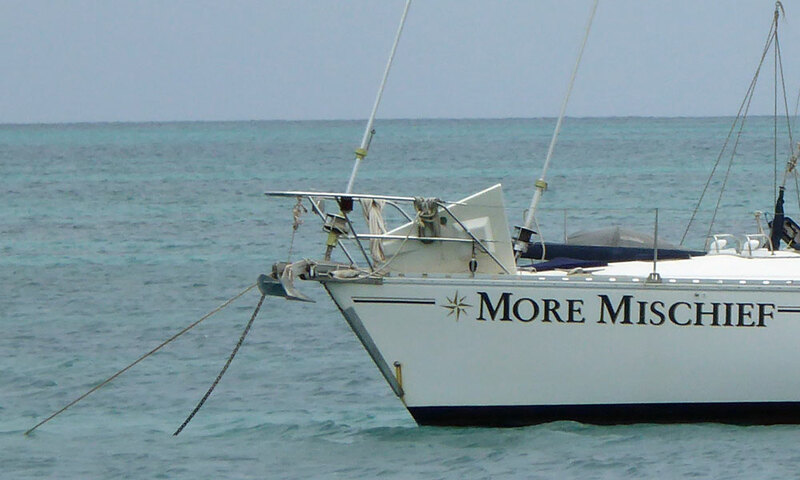 A doubled-up anchor snubber on this monohull, but would a single one be better? And a bit of chafe protection through the toerail wouldn't go amiss! Why? Well, Youngs Modulus of Elasticity tells us that stress is proportional to strain or, more simply, if you double the load, you double the stress - which is not really a mind-blowing deduction and shouldn't come as a major surprise to anyone. So if you've got two snubber lines sharing the load, you can only expect half the stretch - which isn't ideal. 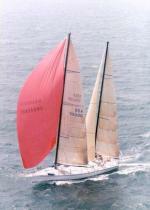 This cutter-rigged monohull needs to have its anchor snubber on a bridle to prevent it from chafing on the bobstay. 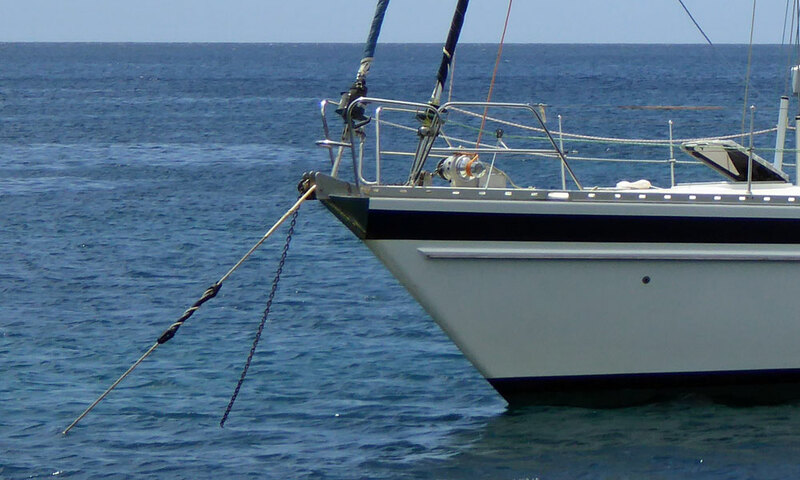 Whether they have a bowsprit or not, most catamaran skippers use an anchor snubber on a bridle to combat their tendency to swing at anchor. A chain hook is the popular option, but I've recently abandoned that approach in favour of a rolling hitch, as it never falls off and is kinder on the chain. What clinched it for me is that I now have another long mooring warp.